Gave myself an extra hour or so to relax and prepare for Sunday at Pitchfork, which unfortunately meant missing the first two acts of the day. I did watch most of Kilo Kish‘s performance on the live stream while handling some writing and other business at home, and in all honesty I really enjoyed it. There was an incredible charm and personality about her that radiated through the songs, and she took what could have been a standard “DJ plays tracks and singer sings along with them” approach and turned it into real art. While portions may have seemed like a performance from a high school play, I think the risks she took – from using props like briefcases and telephones to flailing her arms around like they were dislocated – were fascinating and charming for the most part. That’s about all I’ve got to say on the subject, except that I intend to be physically present the next time she plays a show in town. The first official set I saw on the grounds of Union Park on Sunday was from Chicago’s own NE-HI. On record, they’ve got a very solid garage pop sound that’s somewhat reminiscent of fellow Chicagoans Twin Peaks. NE-HI can be a little bit louder and a touch more psychedelic when the mood strikes them though, and that is well reflected in their live performances. Actually, there’s a little bit of excitement just in the fact that the band is able to ditch some of the more polished moments on their most recent album Offers in favor of a looser and wilder approach. Their energy is compelling, even in the moments where the songs aren’t. They jump, kick and twist their bodies while powering through their set list, barely stopping to catch their breath. It was probably one of, if not the biggest crowd they’ve ever played in front of, and they definitely made the most of the moment. Closing the set with a torn up and blistering cover of Harry Nilsson’s “Jump Into the Fire” felt remarkably appropriate, and seared into my brain the idea that these local boys have bigger and better things ahead for them in the future. At one point I stepped away from NE-HI’s set to see what was happening at the Blue stage and find out how Derrick Carter was doing. DJ sets typically don’t do much for me, unless the artist is doing something beyond standing behind decks twisting knobs and pushing buttons. In the case of Carter, he was very nonchalantly playing a variety of songs, and casually sipping on a drink while doing so. Not the most inspiring visual. But if you didn’t pay attention to any of that and simply listened, you’d hear an incredible mixture of soul, funk, R&B, disco and other dance friendly textures. The guy is so good at his job, he literally makes it look effortless. The crowd was certainly into it, and it was encouraging to see the dance party he was inspiring. I may have left after 10 minutes, but those were some really good (and really fun) 10 minutes. 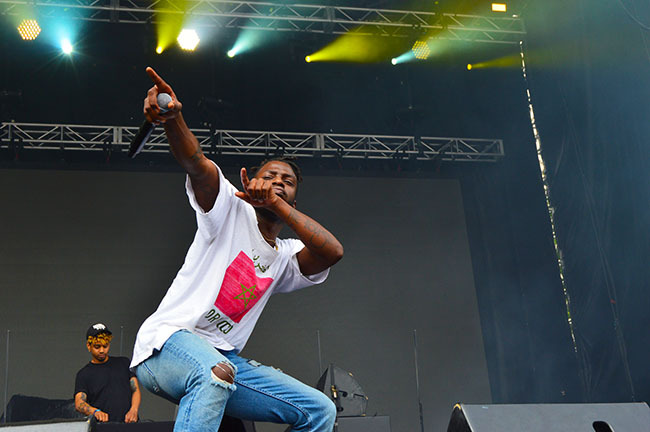 What can I say about Isaiah Rashad‘s Pitchfork set, other than it was fine? Despite the fact that a lot of his tracks deal with some difficult topics and hard truths, there was a good amount of energy and enthusiasm happening both on stage and off through most of the performance. Rashad worked both sides of the stage in equal measure, complete with a variety of poses and gestures to accent a lot of his points while his DJ played the backing tracks. Sometimes there was audience participation, with everyone waving their hands in the air from side to side, or clapping along with the beat. At one point Rashad stopped in the middle of a track because he messed up a bit and was having trouble getting back on point. Credit to him for admitting to it, and starting over to give it his all. He also seemed very appreciative of his fans, who did their best to sing or rap along with some of his bigger hits. Compared to Danny Brown’s wild party atmosphere and Vince Staples’ intense ferocity on Friday, Rashad just seemed a little lackluster. There wasn’t anything particularly wrong with his set, but there simply wasn’t a whole lot to distinguish himself either save for the tracks themselves, and they can only do so much of the lifting. Joey Purp‘s set was similarly decent, but also lacking in some different ways. Backed by a DJ and Chicago legend Peter Cottontale on keys, Purp came out with a lot of energy and a lot of sincerity. At first it seemed like his intent was to overwhelm the crowd with focus and intensity, tearing into each track like a dog with a piece of raw meat. It was effective initially, but began to wear thin when it became clear this was his only mode of operation. There wasn’t much nuance to it, and without those shades it sometimes felt like you were watching a blunt rap instrument devoid of any sense of personality. Of course a majority of his tracks are about dark topics like death and drugs and mental illness, so his approach makes sense it just needs a little calibration which will most assuredly come with time. The other issue relates to that, because a few songs into his set, Purp and some of his friends started tossing water balloons and spraying water guns into the crowd. It wasn’t very hot out, but the move was supposed to be a bit of playful fun. It achieved the desired effect, because people went nuts. Combined with all the beach balls in the air, one could easily stumble upon this set and assume it was a wild party. To a degree, they’d be right! Yet the celebratory vibe, along with lots of dancing and a “hands in the air” sort of mentality, worked as a direct contrast to the seriousness of the material. I’m sure lots of people had a great time, but if the music had done its job right, were they supposed to? Ah, it’s an outdoor summer music festival, so maybe that’s not the right environment to think about those details. In a very realistic sense, Hamilton Leithauser is nothing without his voice. The guy is a quality songwriter and guitar player too, but those things don’t set him apart nearly as much as his singing does. To put it another way, if you had someone else capably sing all of his songs, the results would be far more pedestrian and boring because few can match his uniquely charming croon and wail style. Especially when placed in the context of Union Park on a Sunday afternoon, Leithauser managed to put together an engaging and even at times exciting set that very easily could have fallen flat on its face. The songs from his most recent album I Had A Dream That You Were Mine, which was a collaboration with former Vampire Weekend member Rostam Batmanglij, managed to collect diverse styles from the past (doo-wop, alt-country, torch songs, barroom ballads, baroque pop) and unite them all with a voice capable of handling those acrobatics. He played that entire album out of order at Pitchfork, and its often dusty and weary melodies seemed to echo the sentiments of a lot of the crowd following two and a half days of music festival-going. But Leithauser’s clear enthusiasm for the material, combined with a few uptempo numbers like “Alexandra” from his 2014 solo debut, felt like encouragement to press onward through both the set and the rest of the weekend. There was some sort of issue with one of the pedal boards, which delayed the start of Ride‘s set by about 15 minutes. It didn’t matter much in the grand scheme of things, because with The Avalanches having just cancelled last minute and Jamila Woods getting moved over to the larger Green stage, times were being shifted a little anyways. After kicking things off with a couple of stronger songs from their recent reunion record Weather Diaries, the band began to dip their toes into some of the classic stuff. There was an audible scream of excitement when the first notes of “Seagull” were struck, transporting the crowd back to 1990 and the classic Nowhere album. The mountainous “Leave Them All Behind” served as the perfect centerpiece for the set, and reaffirmed the band’s place among shoegaze legends. Personal highlights also included the back-to-back combination of “Taste” and “Vapour Trail”, both of which managed to stun as well as surprise. It’s thrilling that this band is back together making music again, and with the late afternoon sun streaming through the nearby trees, added an extra dose of serene beauty to their distorted and epic arrangements. The noise and destruction might have been a better fit in a dark venue with an impressive light show, but as “Drive Blind” built up a stockpile of noise on its way to a thrilling conclusion of the set, the looks of pure joy on the faces of fans implied that in the end didn’t really matter either way. Long may they reign. If you had to choose an opening act for Solange, most assuredly Jamila Woods would be at or near the top of the list. Her exceptionally smooth and poetic R&B draws you into its warm embrace, creating a sense of comfort and security. Her quick move from the small Blue stage over to the far larger Green stage as a result of The Avalanches cancellation must have seemed just a touch daunting at first, and Woods certainly seemed tentative at the start of her set. It’s highly likely she’d never performed in front of so many people before, and with no competing music happening on the other stages, she had the attention of everyone (or at least those not distracted by beer, bathrooms or booths). It felt fitting for the festival to feature a great local artist in such a capacity as well, fostering a greater sense of community ties and rewarding quality, even if it’s by pure happenstance. But after some tentativeness early in the set, she found a comfort zone where her band and trio of backup singers all fell in sync. Right around “Way Up” is when things really came into focus, as her songs began to glow on their own across the sun strewn park. It may not have been the most exciting or entertaining or loudest set of the day by a long shot, but it oozed with nuance, passion and complexity that rewarded those devoted enough to watch and pay close attention. Of course the offical warm-up for Solange’s set came courtesy of Nicolas Jaar and his often obtuse but rather pleasurable set. The couple of times I’ve seen Jaar perform outside of his side project Darkside, he’s brought a full band with him, which added some serious flavor to more static and ambient arrangements. At Pitchfork he stood on stage alone, with nothing but multiple rigs which he used to craft intelligent dance music that ebbed and flowed in fascinating ways. Because one man pressing buttons and twisting knobs isn’t exactly exciting to watch, Jaar had some serious technology to create visualizations on the large screen behind him. A creepy cityscape and a shadowy figure were among the 16-bit-like projections, which worked along with smoke machines to create an atmosphere of dread. The music itself alternated between moments of quieter reflection and cool down to moments of heavy bass and the occasional drop. The sizable crowd taking it all in seemed to understand the ups and downs, staying with it through every turn even when the BPMs bottomed out and you couldn’t dance to anything. But Jaar never stayed in any one place for too long, and within a couple of minutes the melody would start to accelerate again, leading to plenty more dancing and jumping around. It turned out to be an exhilarating bit of catharsis for those looking for one last big energy release before the end of the weekend. There were a lot of question marks leading into Solange‘s set, but perhaps the biggest among them was whether or not she’d actually show up. She’s backed out of multiple performances so far this year, often with little to no advance notice and not much explanation. So when her 8:30pm set time arrived and nothing happened, there was some cause for concern. Thankfully by 8:45, Solange and her band emerged, arriving in artful and decadent fashion, as one might expect. Everyone on stage was clad in a deep red, which matched the lighting and made the entire area look like a photography darkroom or a beating heart. It only makes sense then that the crowd quickly fell in love with the performance, as it took a very sedate yet professional approach. A majority of the songs pulled from last year’s A Seat at the Table, which may not be the liveliest record but goes extremely deep with its songcraft and meaning. What the songs themselves lacked in energy, the carefully choreographed movements and dancing pulled you into Solange’s world and provided plenty of reasons to stay invested through the duration. That was the entire point, and the intensely designed and precise nature of every single thing on stage was incredible to behold. Every single person stood where they were supposed to stand, moved where they were supposed to move, and dressed how they were supposed to be dressed. I would have been surprised if a single hair were out of place it was so finely tuned. There’s an extremely impressive quality to crafting a performance with such care, but it does bother me just a little bit because one of my favorite things about live shows are how spontaneous they can be. When everything is done according to the very rigid standards of a singular auteur, there’s no room for compromise or improvisation. Thankfully Solange was able to break free of her own constraints a couple of different times during the show, but no more so than on “F.U.B.U.” when she wandered off the stage and stood at the crowd barricade to get up close and personal with some fans. It was a nice touch of humanity in a sea of almost alien perfectionism. Of course there was nothing more human throughout the performance than Solange’s vocals, which contained an even deeper wellspring of emotion than might be present on record. Smoother than smooth and capable of doing backflips across octaves from note to note, there were moments, such as during “Cranes in the Sky,” where people froze as her voice left them completely dumbfounded. When combined with themes of race, gender and self-love, there was incredible power that radiated throughout the set, contributing towards making it one of the most meaningful and important of the entire weekend. I honestly can’t think of a better way to close out three wonderful days in Union Park.